Currently http://highlandermagic.info/index.php?id=hinweise says: The recommended round-time for tournament best-of-three-matches is fifty minutes. So should the recommended round time be changed to 60 minutes, and if yes, why? Note that tournament organizers are still able to introduce any deviation from the recommended time limits, but they must be announced prior the registration. Give us in the comments your well rationalized reasoning for either of the options, so the council can weigh in the pros and cons of them. Thanks! Instead of arguing, can't we just compromise and recommend 70-minutes + 5 extra turns? Agreed. Tournament organizers and judges would also absolutely *love* that. And we actually experimented with 70 min rounds back in 2008 in Ropecon. Winner was determined at 2 am. Here's blast from the past: https://mtgsuomi.fi/keskustelu/index.php?topic=49289.msg200958#msg200958 (sorry, in Finnish). I am/was fine with 50-55mins at every tournament I attended, never came to a timeout and had to play extra turns. In my opinion some players just have a terrible time management or extending their turns for an "advantage", because of this reasons 'Senseis Devining Top' is BANNED. So what you are saying is that we have no data on 80 min rounds! Kidding aside, my solution would be to ban fetches, but it is a big change and people hate change, so I do not think it'll ever happen. Well, my account on the round time is clear from pyyhttu's opening post (hi Steph and Dion!). I'm not bound to be against the 50 minutes round time recommendation but mostly it was kind of a reason (as it was recommended on the website) that lead to a dreadful amount of ties in Finnish Highlander Championships. Most of the ties probably would have been played out if there had been at least 5 minutes more. A lot of players I talked with said that 55 minute round time would be better in long tournaments like this (more than 6 rounds) as the tournament is bound to be longer than usual. 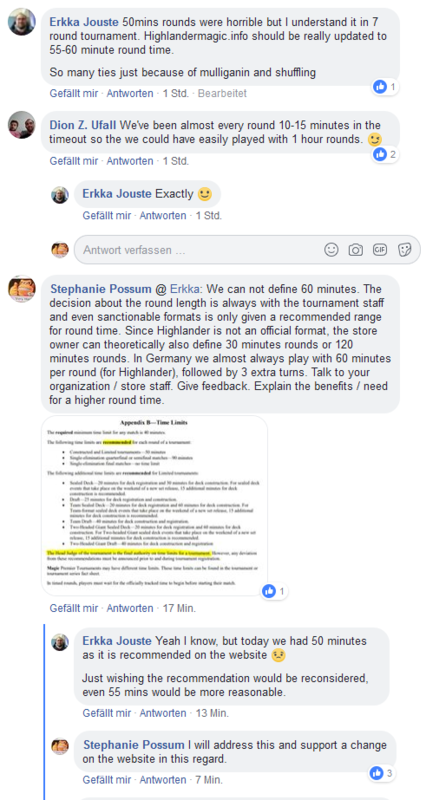 In Finland most of the highlander tournaments are played out with 60 minutes round time with 5 additional turns and that reduces unintentionally drawed matches significantly which is almost and basically always good for the tournament. I think it is certain that format is slower than most of the 60 card deck formats, but unfortunately shuffling and taking a mulligan takes a lot longer time to resolve than in formats with smaller decks. This is just a fact that follows us everywhere unless we want to ban every shuffle effect (fetchlands and all the tutors, ponder, etc) there is and if we do, a lot of people will just leave the format. The draw in a tournament is decided of course by deck building and the speed of the player plays and every player should be aware of those. I'm myself a really fast player (even playing control) and keen to remind people about the clock. However, as highlander is a format with expensive (and/or cool looking) cards, there will be always careful shuffling or so, but still good gameplay shouldn't be allowed to be sacrificed for games to be shorter. Aggros are always fast, Controls always take time and Combos are always hard. All those take time in a different way and we should accept and embrace all of them. 50 minutes is simply too short for this format. Correct me if I am wrong, but the recommended round time for 60 card formats (standard/modern/legacy) is 50 minutes. The nature of highlander is different from these. -Singleton decks are not as consistent as 60 card decks with 4of each card, and the games have big variance in difference. This is something that makes GermanHL attractive, but it also often prolongs games. You might think 50 minutes is enough if you play aggro vs combo, or aggro vs aggro/midrange (just examples, insert any given "fast" decks). But when you have two slower decks playing against each other, you'll start to see the downside of 50minute rounds when you keep having 5-10 minutes time for the last game. 50 minute rounds are too short and cause draws too often in matches where 60 minutes would have been enough for either player to win the match. I would suggest changing the recommended round time to 60 minutes. I've made a poll on facebook, here are the results.